Soup? In the summer? Are you mad? Well no – but whilst looking through the fridge for left over ingredients from last week’s book, I saw that I had some leeks and a whole celeriac. Denis Cotter has a recipe for Celeriac Soup in his book ‘For the Love of Food’ and it is pretty simple. I had all the ingredients – so why not ! All I lacked was the white wine – which I again ‘borrowed’ from Freya’s mum. 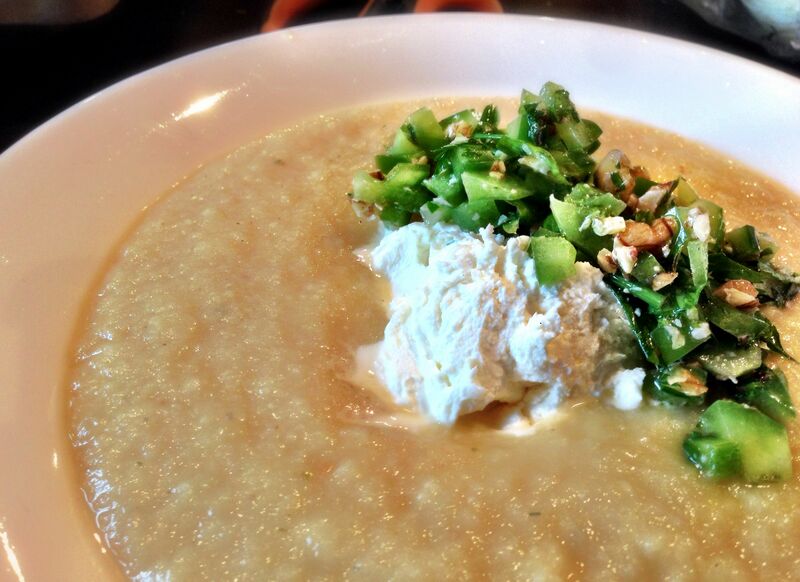 This soup also has a goat’s cheese cream and a green pepper and walnut salsa. Without it I’d have said this would have been bland. But these two additions really make the dish special. For the soup, you fry some leeks and some garlic until soft, add a whole celeriac (diced) and a potato (also diced), and start the boil with 100ml of white wine. Once that’s absorbed, add some vegetable stock and cook until the vegetables are tender. Took 30 minutes for me. Blitz the soup in your favourite blitzer. Season with salt, pepper and nutmeg and serve. Easy! 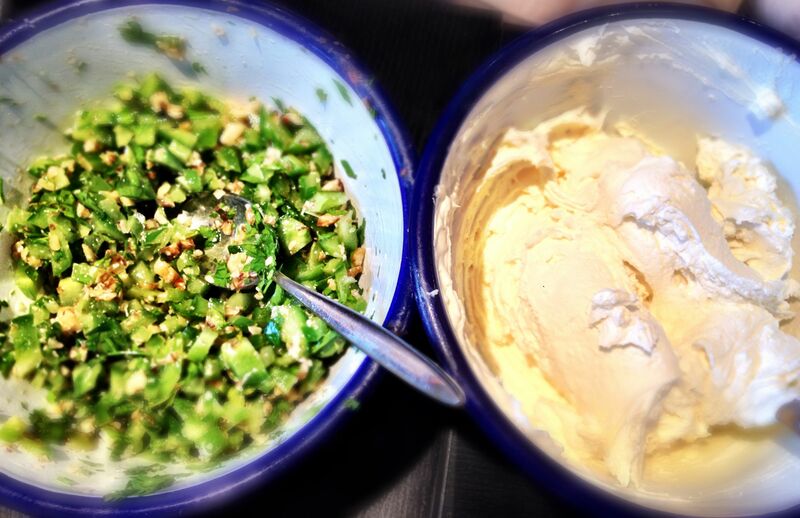 For the salsa, chop a green pepper really small, do the same with walnuts, and add in some olive oil and parsley. Just as simple. We loved this. We ate it whilst watching ‘The Darjeeling Limited’, feeling we had earned a deserved rest after packing up all our stuff for the boat. We ate the leftovers the next day cold – and to be honest it was just as nice cold. Soup’s don’t have to be hot you know. Tonight we unofficially move onto the boat. Officially that will be at the weekend! I love this recipe from Denis Cotter’s ‘For the Love of Food’. I’ve made it before. And it is consistently good – mainly because it is so simple. 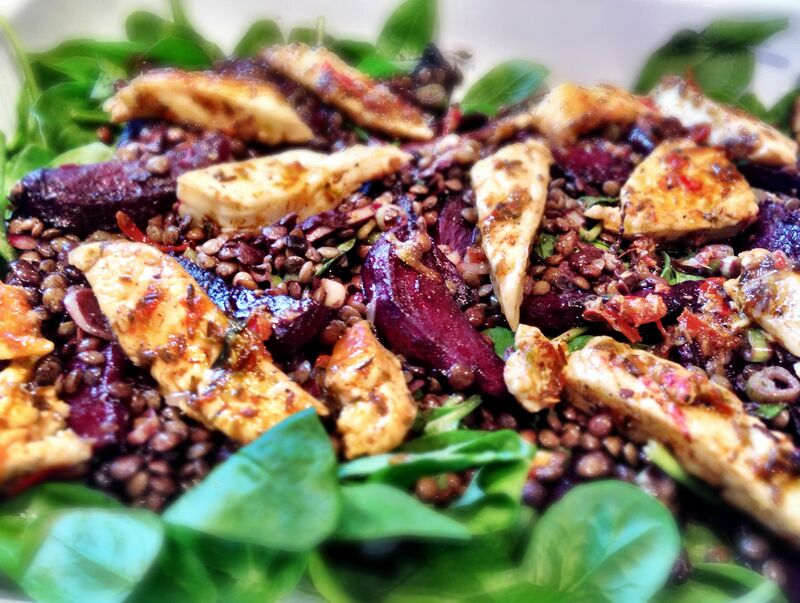 There’s very little ‘doing’ in this recipe – most of the time is spent roasting the beetroot! I feel a little bit like Old Mother Hubbard this week. All my cupboards are bare. Everything is packed ready for the move onto the boat – and basic ingredients like flour are nowhere to be seen! Pretty frustrating – but fortunately I had all the ingredients for this dish in the fridge (except 100ml of red wine which I pinched from Freya’s mum!) I say pinched – I did pay for the wine with a serving of the dinner – so it was a fair trade. The hardest part of this recipe is peeling a beetroot and slicing it into wedges. You just can’t keep your hands clean unless you wear some latex gloves. Anyway – to make this you peel and wedge a beetroot – toss in some balsamic vinegar and a little olive oil and roast (I did mine in my only remaining oven – the Halogen oven) until they begin to caramelise. It took about 30 mins. While you’re waiting, cook some lentils in red wine and stock (with some garlic and thyme) until they are cooked and the liquid is absorbed. While you’re waiting for this, crush some red chilli with some cumin seeds and lime zest/juice; slice some Halloumi, and chop a spring onion or two. When everything is ready, add the beetroot and the spring onion to the the lentils – and allow to start cooling. Then fry your Halloumi until it is golden and rub some of your chilli rub into it. Then serve the lentils on a bed of spinach and add the halloumi on top. This is incredibly easy – and tastes amazing. It’s one of my top five dishes. Consistently good. You can’t get it wrong and it is a very well balanced meal. I wasn’t really successful getting through all the recipes of ‘The Modern Vegetarian’ – mainly due to some very long days at the boat, and lots of packing distractions for Freya’s parents. I was also a bit of a muppet and got excessively enthusiastic about packing – and packed all the food in the larder into a box and took it to the boat – rendering a lot of the recipes impossible to make! That said, I’ve made most of the stuff I said I would – I just haven’t blogged it yet! I will – soon – promise! So this weeks book I’ve decided not to find myself 10 recipes but limit myself to say six! If I get them all done I’ll pick some more. 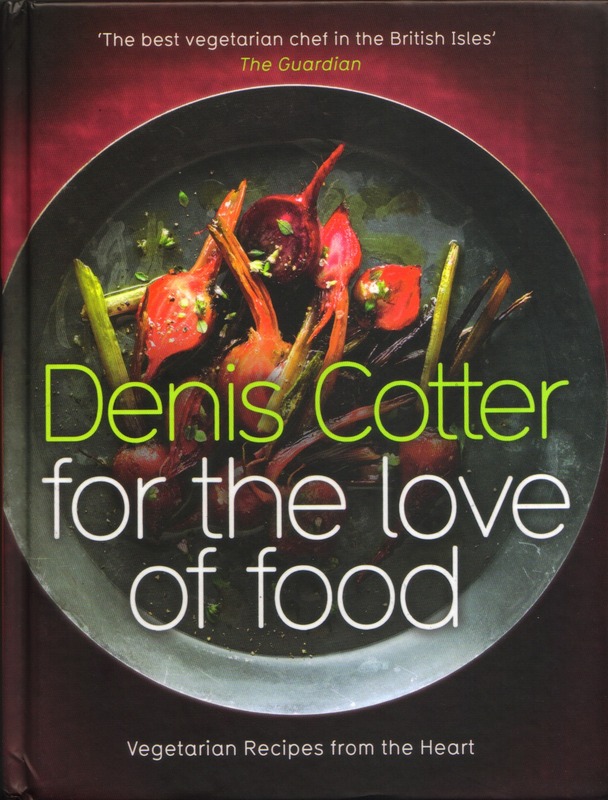 The book is Denis Cotter’s ‘For the Love of Food’. This is a totally vegetarian cookbook. The Guardian say he’s ‘the best vegetarian chef in the British Isles’. Fair praise! I love this book. I’ve cooked from it before and lots of the recipes are nice and simple. Many of them are very similar – especially the salads – but the slight differences between them make them very unique. There are some challenging recipes in this book – I just haven’t chosen any of them for the coming week. I’ve got way too much stuff to do. And it’s Fathers Day on Sunday – where I’ll be out most of the day at Paradise Park in Hertfordshire with my six year old daughter. Don’t they all just roll off the tongue. Denis doesn’t come up with pretty names for his dishes – he just tells you what’s in the dish! This was one of the books that really inspired me to get into cooking again. Check it out – I think you’ll find the same.